Speciality Crops • LumiGrow ""
Changes in the ratio of red to blue light has been proven to affect plant morphology and physiology. Major research institutions, commercial growers, and plant science “think tanks” like the LumiGrow Research Group, are discovering the ways in which plants interact with light. Research has shown that light intensity directly influences growth; and increases in light intensity will increase growth until the plant reaches its saturation point. LumiGrow works with major institutions to run trials and aggregate data to determine the optimal light intensities for your crops. 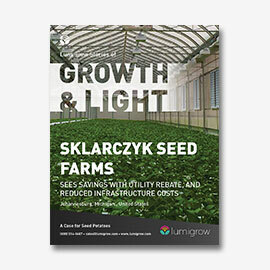 Sklarczyk Seed Farms saves big by reducing their infrastructure build-out costs and receiving a utility rebate. 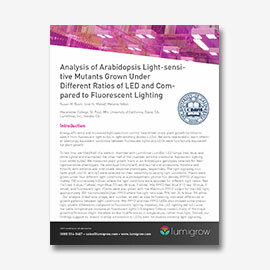 Analysis of LumiGrow LEDs vs. Fluorescent lighting for arabidopsis research.